aimed at promoting a new level of fat burning or what they term as “Hyper-Lipolysis”. So is Oxyshred the messiah of fat burning supplements we’ve all been waiting for or is it just another generic stockpile of ingredients we’re so used to seeing? It used to be that few fat loss supplements came in powder form, however the last few years has seen a slow but steady increase in powdered fat loss supplements. This is mainly because you can generally fit more ingredients and/or higher doses of ingredients into powdered formulations than you can in a capsule or tablet. Initial impressions of Oxyshred is that it is surprisingly similar to USPLabs Oxyelite, however, packaging and name aside, Oxyshred is almost nothing like Oxyelite. With a giant 10g serving per scoop with the option to have 2 scoops per day, Oxyshred at least appears to be a well dosed fat burner. EHPLabs have really broken the mould with their fat loss product with a wild melon flavour and a pink grapefruit flavour, two rare flavours in nutritional supplements. 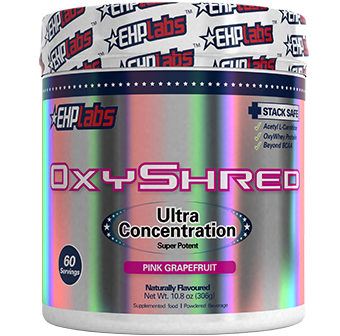 Overall the Oxyshred tastes very pleasant, similar to a tangy cordial, and EHP have clearly done a good job in masking the botanicals used. Unlike many powdered fat burners, there is very little aftertaste, which makes this one of the most pleasant tasting powdered fat burners on the market. However, it does leave a slight fuzzy feeling in your mouth, similar to that of a protease rich fruit, like eating pineapple or kiwifruit. The recommended amount of water to be used is 5 to 8 oz (150mL to 250mL). This reviewer finds the flavour quite sweet and recommends a volume closer to the 8 oz mark. 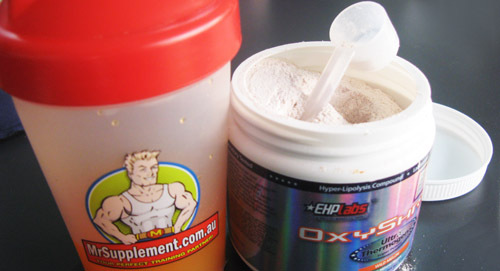 EHPLabs Oxyshred mixes extremely well with a no frothing, little residue, and no grittiness when mixed in the recommended amount of water of 240mL. Perhaps the best thing about Oxyshred is that they’ve included a wide variety of ingredients to deal with a variety of factors that are crucial to successful and long-term weight loss and weight maintenance. Oxyshred contains ingredients to look after fat burning and fat metabolism, overall metabolism and thermogenesis, improving immunity to ensure you’re training well and recovering better as well as enhancing mental function. Mental fatigue is one of the elements of weight loss that are often overlooked. Being mentally tired makes you susceptible to making poor food and exercise decisions and makes sticking to a weight loss strategy and plan much harder. EHPLabs have also stepped away from the mould to focus more on ingredients aimed at raising metabolism and fat burning rather than dose you up on stimulants. This has the benefit of allowing you to use Oxyshred for a longer period of time than most traditional fat burners and also allows you the privilege of using both a fat burner and a pre-workout at the same time to help you work out harder and reach your goals faster. 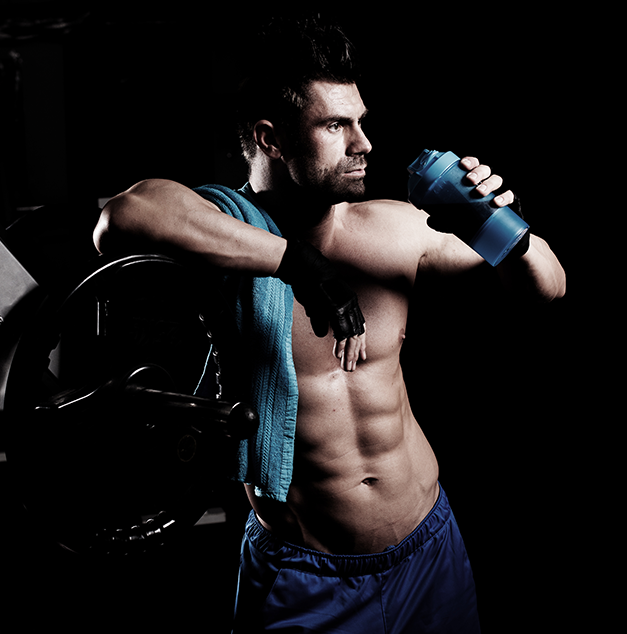 The biggest problem with EHPLabs Oxyshred is its use of a proprietary formula. This makes it almost impossible to infer whether there is enough of each ingredient for it to be considered therapeutically effective. While, they’ve made up for this with a larger serving size, they’ve also got a large amount of ingredients to cater for. As such, it is a wise decision to consider taking 1.5-2 scoops on a regular basis once tolerance has been accessed to ensure you’re getting enough of the core active ingredients. EHPLabs choice of ingredients is slightly perplexing. While it is no doubt that many of the ingredients have been included as a result of the latest research, they’ve decided to exclude many ingredients that have long been considered a popular and effective choice in fat burners such as green tea extracts, citrus aurantium and capsaicin/capsiate to name a few. Oxyshred has been leading the market as a fat burner for the last 3 years now, so it's formula definitely works..
An interesting downside to the product, that this reviewer has never previously encountered, is that the scoop handle is far too long for the tub. To close it, you need to bury the scoop tail end first into the powder, which makes a bit of a mess when you attempt to retrive it for subsequent serves. It is therefore recommended that you keep the scoop outside of the tub. Overall, EHPLabs Oxyshred offers a unique fat burning formulation which offers a well rounded approach to fat and weight loss. Breaking the moulds of many other companies with the use of a powder, their idiosyncratic choice of flavours and ingredients as well as their focus away from stimulants. Oxyshred is a versatile fat loss supplement and is perfect for those who want to use fat loss supplements for a longer period of time or who want to use it in conjunction with pre-workout supplements. It is definitely a supplement worth trying and one we believe shall meet or exceed the expectations of 95% of users. EHPLabs Oxyshred contains a range of core ingredients separated, along with a full spectrum of B vitamins to help support energy levels. Following is a quick description of the complexes, the ingredients contained within each complex and their function and effectiveness. The Hyper-Lipolysis Compound complex contains the majority of the core ingredients with 11 ingredients in this complex. Chromium picolinate has long been associated with improving insulin sensitivity and attenuating body weight gain especially in persons who are already diabetic. However recent studies have not shown as much promise in people without diabetes. Typically used as a brain booster, ALCAR is also considered effective in alleviating fatigue, muscle damage as well as improving insulin sensitivity and exercise performance. Its association with fat and weight loss is not as strong, and it is believed that its effect on fat loss is mediated by improvements to energy. An omega 6 fatty acid, CLA has been implicated in weight and fat reduction, especially CLA-10. The evidence for CLA for fat loss is however still quite mixed, but its fat burning effects are better when taken long term and at higher doses. Few studies have been conducted on grapefruit seed extract providing the active compound bergamottin. Compounds of grapefruit have been able to show improvements in fat mass through increased AMPK activity which can increase metabolic rate. A chemical compound found in olive leaves which can have an anti-inflammatory, antimicrobial, antiviral and antioxidant effect. Studies have shown it may be helpful in reducing blood lipids and may be able to help enhance thermogenesis. The active component of the Guggul plant, which can help decrease blood lipids and help with obesity, most likely due to its ability to increase thyroid activity and thus affect metabolic rate. A native mango from Africa and Southeast Asia, it has been shown to help reduce fat mass and works better in conjunction with cissus quandrangularis. An extract from raspberries which has been implicated to help with weight control and with increasing fat metabolism and reducing fat accumulation. Studies have however only been in animals and in vivo. Molecule derived from fruits and plants which has anti-inflammatory and anti-asthmatic effects. It is also being used as a fat burner due to its ability to act on beta 2 adrenoreceptors. Green coffee extract is found in green or raw unroasted coffee. One of the compounds found in GCE is chlorogenic acid. Studies have shown that consumption of GCE results in significant weight loss, due to its ability to affect post-food rises in blood glucose and blood lipids. While the mechanisms for GCE promoted weight loss is still inconclusive, studies have suggested reductions in glucose absorption, changes in glucose metabolism and suppressed fat accumulation to be major factors. The Oxyshred Immunity Booster contains 2 ingredients including L-glutamine and Vitamin C.
The most abundant amino acid in our body, L-glutamine is vital for protein synthesis and is also a potent immunity booster for those exercising for long durations and at high intensities. Vitamin C is a compound that has long been considered beneficial for oxidative stress and immunity, especially to reduce the severity of cold and flu symptoms. The Oxyshred Mood Enhancer contains three potent ingredients including caffeine, taurine and tyrosine. Caffeine is a compound found predominantly in tea and coffee and is classified as a stimulant. It is able to boost exercise performance, mental alertness and focus as well as being beneficial for suppressing appetite and has been implicated in helping with moderate fat and weight loss. A semi-essential amino acid, taurine is best know for its ability to help with symptoms of diabetes including insulin resistance. Taurine may also help with protecting testosterone levels due to its ability to prevent oxidative stress reducing testosterone levels. A non-essential amino acid which is a precursor to neurotransmitters and may be able to improve moods. It has been studies to help reduce the effects of stress, fatigue and cold. 2. Trumbo PR, Ellwood KC (August 2006). "Chromium picolinate intake and risk of type 2 diabetes: an evidence-based review by the United States Food and Drug Administration". Nutr. Rev. 64 (8): 357–63. 4. Villani RG, Gannon J, Self M, Rich PA. ‘L-Carnitine supplementation combined with aerobic training does not promote weight loss in moderately obese women.’ Int J Sport Nutr Exerc Metab. 2000 Jun;10(2):199-207. 5. Steck SE, Chalecki AM, Miller P, Conway J, Austin GL, Hardin JW, Albright CD, Thuillier P. (2007). "Conjugated linoleic acid supplementation for twelve weeks increases lean body mass in obese humans.". J Nutr.137 (5): 1188–93. 8. Omar SH. ‘Oleuropein in olive and its pharmacological effects.’ Sci Pharm. 2010;78(2):133-54. doi: 10.3797/scipharm.0912-18. Epub 2010 Apr 23. 9. Oi-Kano, Yuriko; Kawada, Teruo; Watanabe, Tatsuo; Koyama, Fumihiro; Watanabe, Kenichi; Senbongi, Reijirou; Iwai, Kazuo (2008). "Oleuropein, a Phenolic Compound in Extra Virgin Olive Oil, Increases Uncoupling Protein 1 Content in Brown Adipose Tissue and Enhances Noradrenaline and Adrenaline Secretions in Rats". Journal of Nutritional Science and Vitaminology54 (5): 363–70. 11. Ngondi JL, Etoundi BC, Nyangono CB, Mbofung CM, Oben JE. ‘IGOB131, a novel seed extract of the West African plant Irvingia gabonensis, significantly reduces body weight and improves metabolic parameters in overweight humans in a randomized double-blind placebo controlled investigation.’ Lipids Health Dis. 2009 Mar 2;8:7. 13. Fontana E, Morin N, Prévot D, Carpéné C. ‘Effects of octopamine on lipolysis, glucose transport and amine oxidation in mammalian fat cells.’ Comp Biochem Physiol C Toxicol Pharmacol. 2000 Jan;125(1):33-44. 15. Onakpoya I, Terry R, Ernst E. ‘The use of green coffee extract as a weight loss supplement: a systematic review and meta-analysis of randomised clinical trials.’ Gastroenterol Res Pract. 2011;2011. pii: 382852. Epub 2010 Aug 31. 16. Calder PC, Yaqoob P. ‘Glutamine and the immune system.’ Amino Acids. 1999;17(3):227-41. 17. Hemila (2007), The role of vitamin C in the treatment of the common cold. Am Fam Physician, 76: 1111-1115. 18. Burke LM, Stear SJ, Lobb A, Ellison M, Castell LM. ‘A-Z of nutritional supplements: dietary supplements, sports nutrition foods and ergogenic aids for health and performance--Part 19.’ Br J Sports Med. 2011 Apr;45(5):456-8. doi: 10.1136/bjsm.2011.084988. 19. Rasmussen DD, Ishizuka B, Quigley ME, Yen SS (1983). "Effects of tyrosine and tryptophan ingestion on plasma catecholamine and 3,4-dihydroxyphenylacetic acid concentrations". J. Clin. Endocrinol. Metab.57 (4): 760–3. 20. Hao S, Avraham Y, Bonne O, Berry EM (2001). "Separation-induced body weight loss, impairment in alternation behavior, and autonomic tone: effects of tyrosine". Pharmacol. Biochem. Behav.68 (2): 273–81.